Linné on line – Medicinal plants are important for today’s medicines! Medicinal plants are important for today’s medicines! 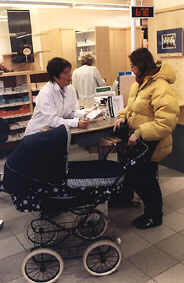 A modern Swedish pharmacy, Apoteket Leoparden (Stockholm) which was opened in 1996. For many centuries most of the medicines sold in pharmacies all over the western world were parts of dried plants. Among the range of products there were even animal parts and various non-organic salts. It was only during the 19th century, thanks to advances in chemistry, that it became possible to isolate the first chemical substances from medicinal plants. At the turn of the century isolated compounds became more common in the pharmacies. Today it is estimated that around 40 % of the drugs in Swedish pharmacies are natural products. If also including the herbal remedies in health food stores it is obvious that plants play an important role in medicine even today. Traditional medicine was formerly used in Sweden as an alternative to school, or official, medicine, and this is how it is still used in many developing countries. It is estimated that 80% of the world population is dependent on traditional medical treatment for various illnesses and that 85% of such treatments are based on plants. Historically, know-how about plant-based treatments has been handed down through apprenticeship, with new knowledge being added continually. In time there was a need for special people – shamans or medicine men – to keep all the knowledge. In the western world this development finally led to a separation between the medical doctor who recommended a certain medicine and the pharmacist who prepared it. During the 16th century most of the medical doctors in Sweden were immigrants. The same was also true in other parts of health-care, for instance the barber-surgeons. In the 17th century a few Swedes studied medicine abroad; they then returned to Sweden to practise. When Linnaeus was young at the beginning of the 18th century, there were no more than a dozen governmental positions for physiciens in Sweden. 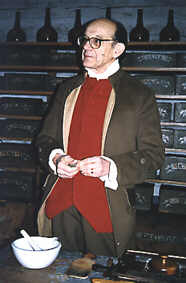 A pharmacist in the 18th century pharmacy at Skansen Museum (Stockholm). Linnaeus’ parents were therefore not happy with his choice of career, since being a doctor was an uncertain profession. The few doctors that existed had posts in the towns. In order to open up the possibility of healthcare even in the countryside, the authorities tried to spread medical knowledge out to the parishes. Books were published that contained advice on treatments and suggestions for medicines that should be available in every parish. These books were distributed to the priest, a parish official or other person of similar standing. Blood-letting is an old cure that's no longer practiced in western school medicine. 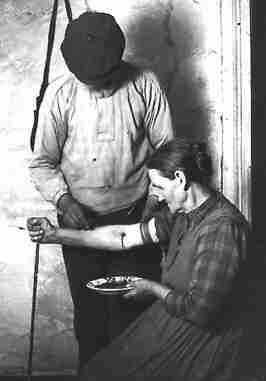 Blood-letting in 1922. There used to be so called ”wise people” in the country. They were local people with some medical skills or quacksalvers who took it upon themselves to treat their neighbours. That was the healthcare in Sweden at that time. But eventually medicine developed and the number of medical doctors increased. By the mid 18th century there were between 40 and 50 physicians in the whole of Sweden. It became easier for more people to get access to “qualified” healthcare. Traditional or folk medicine was an option when you couldn’t reach a qualified doctor. During the 18th and 19th centuries many books of popular medicine were published. These were often written by qualified doctors, published in multiple editions and widely used. As early as the 18th century, practitioners of traditional medicine had access to popular versions of school medicine when treating their patients’ ailments. You could say that health foods and alternative medicine ought to be considered as today’s folk medicine. Many of the medicinal plants that are nowadays sold in health food shops used to be available from pharmacies. What is new to us is really only those plants that have come from the school medicine of other cultures, such as the Asian medicinal plants like ginseng and ginkgo. Indeed many of the methods that alternative medicine uses have previously been used within school medicine. Also many theories used in alternative medicine, now launched as new alternatives, have once been a part of school medicine but have in time been discredited. Substances from plants can be efficient drugs but it should be remembered that, ”the dose makes the poison”, as put by the 16th century physician Paracelcus. The dose is all that makes a poison or not. Substances with medicinal effects can also produce side effects, which of course also applies to herbal remedies and health food products. What is natural is not necessarily always as non-dangerous as people imagine. Think of plants like monkshood, February Daphne, autumn crocus, hemlock, and henbane, fungi such as death cap or destroying angel, or substances like cocaine, nicotine and morphine. All of these are natural products and exemplify the fact that what is natural may be far from harmless. How is a modern drug developed?